The previous post reminded me of this problem, which is one of the most intricate and wonderful compositions I have ever come across. It involves a “rundlauf,” which is a rare maneuver in chess compositions where a piece charts a geometic pattern on the board returning to its initial square. In over the board play this occurs most often in endgames (think triangulation), though even there it is extraordinarily rare. If you imagine yourself as white in the above position, where black has two pawns about to promote, would you be fighting for a draw or searching for a mate? The idea involved requires an elaborate sequence of forcing moves that pushes the king with mate threats at every turn. The knights dance in a cascading pattern across the board to remove a pawn, only to return to the original position and push the black king in the other direction to deliver mate. 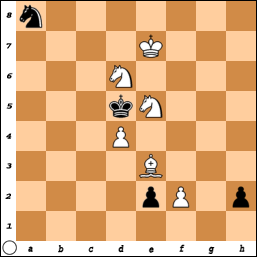 Think it over before clicking through to the solution- here’s the hint: Mate in 12!